America-born Kewpie is so loved and popular in Japan. 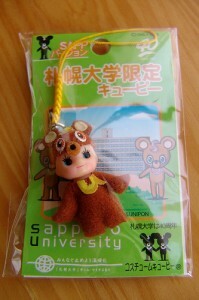 Especially small sized kewpie doll key chains and cell-phone straps are sold well. They are in varieties of costumes, and there are even region original versions, which are available in certain places!! They made is for the 40th anniversary. Kusatsu is a famous hot spring town in [W:Gunma Prefecture]. 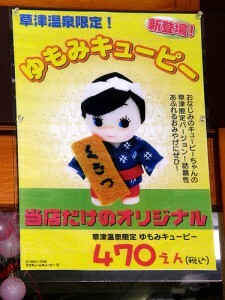 This Kewpie is in a costume of a yumomi person who stir hot spring to cool down. 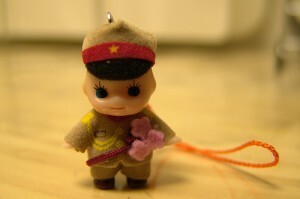 It’s the Forces’ original Kewpie in the army costume. The left one is oyster, and the right one is fish cake. Both are the region’s specialties. 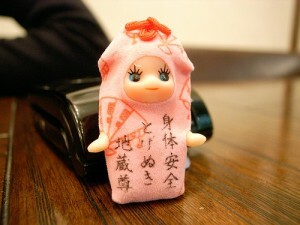 It’s in the omamori (Japanese amulet pouch) from the town’s famous temple. Even though I live in Japan, I had never seen the exclusive Kewpies. 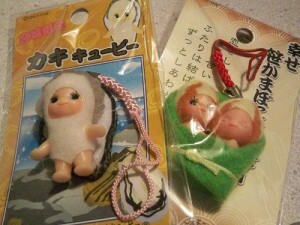 If you are interested in buying these Kewpies, please feel free to contact me. Is there any Kewpie in a unique costume in your country?